Charming Doodle...sew it, build it! : One! My baby Isa will turn ONE this week! It's hard to believe she's been here a year already! She is the sweetest baby ever and is a joy to be around (most of the time). I'm sure I'll be taking lots more pictures of us celebrating our baby girl's first year. 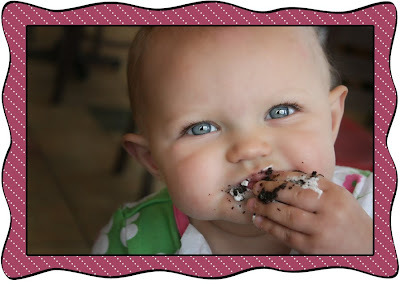 But here is at least one picture of her eating cake for the first time. The kids have been with my parents for the last week because I had a full week of Board meetings at a remote location and couldn't have the kids with me. They always have lots of fun with grandma and grandpa. This morning we met halfway so I could get the kids back. The only place to meet is at a gas station. Fun place for a birthday party, huh? So this picture of my girl was taken at a Subway restaurant inside a gas station as we sang a quick Happy Birthday! She LOVED the cake and I'm sure will be quite happy that this wasn't her only birthday celebration...more cake to come in a few days. What a cutie!!!! Glad we could be there. Happy Birthday, Isabella!!! !